The premise behind Urp! – the latest casual game from indie developer Crazy Tooth Studios – is simple, thin even, as the small dinosaur-like creature Urp awakens from slumber to find that his planet has split up into many smaller chunks, and with it his (or her) collection of eggs have also been scattered throughout the galaxy. Urp must now travel from planet to planet, re-stabilising them while collecting coins and eggs. The story is pretty inconsequential, but is told through a series of comic-style static panels, progressing the narrative a little as you progress from one galaxy to the next. Once you get into playing the levels, the plot will be easily forgotten. 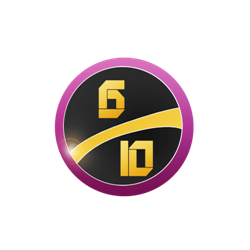 The game spans sixty main levels, split between galaxies of ten stages, with a series of seven bonus levels unlocked by collecting all eggs in each galaxy. These groups of levels all share similar characteristics or themes, such as the ice galaxy and the volcanic-style one. 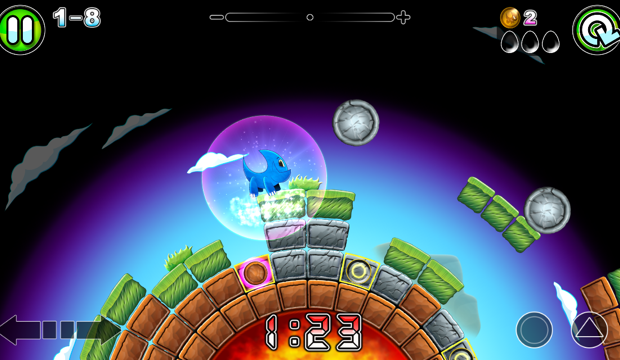 Gameplay is controlled by touch, using left and right arrows, two action buttons to jump or smash, and swipe movements. Thankfully, the developers have made the controls into zone controls. 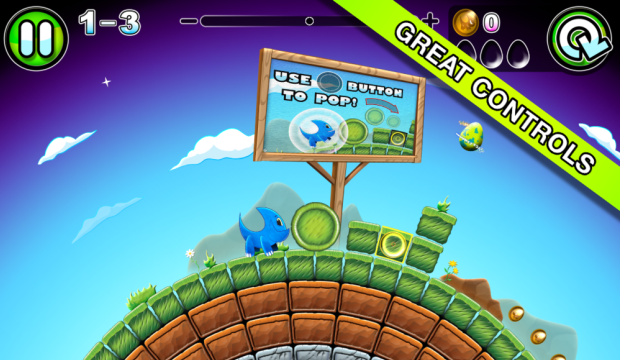 This means that where a button appears, that entire vertical slice of the screen can be pressed to activate the control. Therefore, theoretically, if your finger slips off the button, it should still work with no problems . The buttons do however appear quite small on a mobile screen, and even with the zone controls, sometimes your fingers seem to stray and press the wrong action. This seems to mainly be an issue on smaller screens, as the iPad version is easier to control. It is just a shame therefore that the action zones are so slim. Each level is a three-hundred and sixty degree planet, which Urp must traverse, pushing circular planet chunks back into their corresponding holes in order to stabilise the planet. The puzzle element comes into play as you have to make sure the right circles go into the right holes, in the right order. Get this wrong and you can cause a dead-end, or block your path towards collectables. 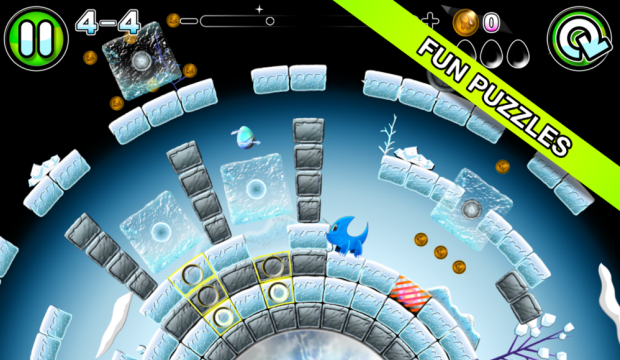 More elements enter puzzles as you progress to different worlds, such as blocks you must smash through by swiping down on the screen, or destroy with your blast attack. Also, slippery surfaces and launch pads will feature, as levels require you to plan your progress through them, picking the best track to take in order to score as many points as you can. All the while, each stage is also timed – adding an extra element of panic and frustration to proceedings. Nothing is more frustrating than realising you have finally solved the puzzle for a level, only to run out of time before you can finish. This isn’t irritation through bad design though: levels begin slowly and simply, with a tutorial of sorts spanning the first few stages, before ramping up and getting more creative and taxing. There are a few stand-out levels that break the formula, but other than that they all follow a similar pattern, which can feel a little repetitive after a while. Collecting all coins and eggs in a level is the way to get a perfect score on a stage, and as mentioned earlier grabbing all the eggs will unlock bonus stages. At the same time, collecting coins will allow you to enter the store between levels and customise Urp. You can purchase hats, shoes and more, which can increase your speed, jumping height or give you double jumping powers depending on what you pick. Obviously you won’t be able to purchase all upgrades and items, so this is where in-app purchases come in. Thankfully none of these are required to finish the game to its basic level (some may be needed to unlock all extras), but in-app purchases can largely be ignored – except for the silly way that some eggs cannot be collected without specific upgrades, which is a bit of a disappointment. Visually, Urp! isn’t anything to write home about. The graphics are incredibly basic, but that suits the puzzle genre down to the ground. Ok, perhaps if the Urp sprite was more detailed and had a little more character then it would be more likeable and gamers would connect with it a little more, but the simple two dimensional backgrounds and sprites are all that is needed. This does unfortunately mean that Urp! won’t stand out from the thousands of other puzzle games based on first impressions alone. The same is true of the music and sound effects: neither are very unique and the music is actually fairly annoying. VERDICT: The puzzle design and learning curve for Urp! are both well-balanced, so new players can ease themselves in before taking on the more challenging later worlds. Urp! certainly won’t blow anyone away, but its gentle challenge makes it very accessible aside from the niggly controls, which can make even the simplest level navigation sometimes degenerate into a frustrating experience. The lack of a coherent story will also limit the appeal of Urp! but if you stick with it, it is a simple, enjoyable puzzle game. Crazy Tooth StudiosUrp!Ursa Major Media Inc.